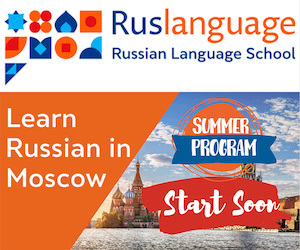 How many Russian words do you know? 1,500 words are required to smatter of the language. 15,000 words provide good command of the language. It really takes an eternity to learn so many words but you could help it. Here's what you should do to organize the process of learning foreign words correctly. Start a separate notebook (or create a text file) to write out all the new words you plan to remember. Try to write out the word along with the sentence containing it. Learn most widely-used words first (those that can be found in 25,000 word dictionary). Try to learn established word pairs. For example, memorize 'an obstacle' along with 'to overcome', 'clothing' along with 'to wear', etc. Learn new words with their proper prepositions. Ex. : "по радио" (over the radio). Review learned words in accordance with the plan rather than on a daily basis. Now that you know the general principles look at some methods of learning new words. This method is the simplest but least effective. Write out 20 to 25 new words in a column. Put foreign words on the left and their translation to your native language on the right. Focus on memorizing the words for good. It is important to concentrate your attention. Now read the whole list carefully line by line. Then have a ten minute break doing something else. After that cover the left column and try to recall the script and pronunciation of all the words from the list. Skip the word if you can't recall it for long. Have another five minute break. Then recall all the words again. Try to concentrate your attention on the words you could not recall the first time. Go on reviewing until you are able to recollect the translation of all the words from your list (however put the learning off if you feel tired). Have a rest now. It is needed for your brain to regain its strength. Review your word list in 7-10 hours after you've learned them. Then review it each 24 hours. The total of four revisions is required and enough. Note: It is good to put new words on 0,8 x 1,2 inch cards with Russian words on one side and their translation on the other side. Now think of a picture that would combine the images of snack and snow. The picture should be unusual, illogical and include some motion. Well, imagine you take a snack from a table and put it into a freezer. The freezer starts working like hell and the snack is being coated with white and shining snow before your very eyes. That's it. Thanks to that picture, the Russian word "снег" will make you recollect the English word 'snow' (and vice versa) every time you encounter it. Pay special attention to the process of movement because static pictures are quick to escape your remembrance. Do not learn more than 25 words at a time. Now imagine a narrow passage. You are pushing forward a pram full of milk. A mule is on your way, its head tightly pressed to your pram. It is trying to move forward and prevents you from pushing your pram obstinately. This picture will work great. 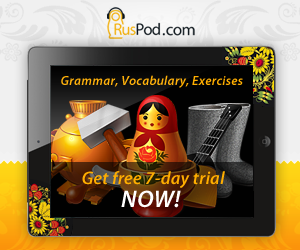 Record 40 to 50 new Russian words with their translations. Listen to the recording as many times as possible at normal volume level. You don't need to pay any attention to what you hear. After a great deal of playbacks the words will be memorized of their own accord. Here, you should feel and manipulate the subject designated by the word you want to remember. Thus, if you are going to learn the word "свеча" (a candle), take a candle, touch, smell, explore it and finally put a match to it. Or if you want to remember the word "ласкать" (to caress), caress your cat. It is necessary to pronounce the words in Russian while repeating your actions several times.